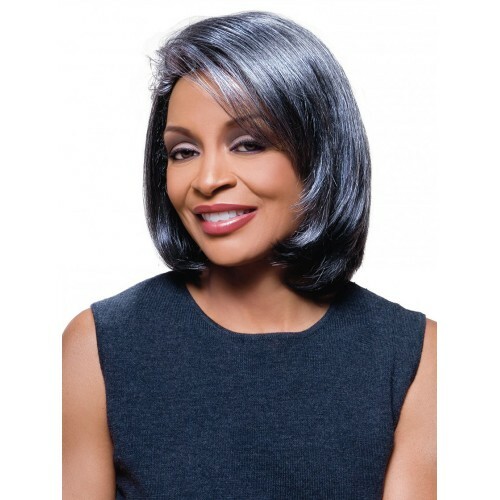 The Jamie Synthetic Wig by Alicia Beauty's Foxy Silver collection is a medium length bob cut with tapered ends and an off-center part on the right side. Using top of the line materials and construction, this smooth and face-framing hair style also has a sweeping side fringe for an extra touch of allure. Soft and resilient synthetic fibers emulate the rich texture and appearance of human hair without the maintenance since the style is already set in. These fibers are crafted right into a machine-stitched standard wig cap for high quality comfort and security that lasts all day. Ready to wear straight from the package, the Jaime is the perfect look for your next business meeting or dinner party!